Even if you're the most impulsive adventurer, it still doesn't hurt to know a bit about Saint-Loup-Lamaire before you go. Mark it on your map, make a list of what you can do there and let the good times roll! If you journey 9 miles (14 kilometers) north of Parthenay, or 15 miles (24 kilometers) south of Thouars, you'll be in Saint-Loup-Lamaire. With Travelocity, you'll get an amazing bargain if you secure an accommodation and flight bundle. You can also select from at least 400 partner airlines and 665,000 places to stay. From flights and accommodations to experiences and car rentals, we provide 24/7 personal assistance via our Customer 1st Guarantee. Noticed an even better bargain elsewhere? We'll meet the price and refund the difference^. You're able to modify any of your vacation plans with no extra charges on our end. You know what that means, right? You've got nothing to worry about! And as long as you get in quick, many accommodations don't charge fees either^. You should book ahead if you'd like to stay as close as possible to Saint-Loup-Lamaire. The Château de Saint-Loup is the only listed property within a short commute of the center. Where do you fly into for Saint-Loup-Lamaire? Put on your headphones and binge-watch a couple of movies. In no time, you'll be landing at Biard Airport (PIS). It's about 25 miles (40 kilometers) from central Saint-Loup-Lamaire. Can I rent a car in Saint-Loup-Lamaire? Forget the hassle of buses and overpriced cabs. If you plan to do some fun exploring in Saint-Loup-Lamaire, it'd be wise to reserve some wheels via Travelocity. We make it so simple that you'll be crafting your road trip playlist in no time at all! Pick up a car from the Biard Airport area and you can exit the plane and glide right into the driver's seat. Hertz and Avis are waiting nearby to help you out. Stroll around the very old rooms, halls and corridors of The Old Castle. This impressive structure provides an informative outing for the entire family. Want some more options? Forget your history journals! Let the past jump to life at Jacques Guidez Museum. But that's not all. Airvaudais-Val du Thouet Tourism Office is an essential resource to answer any questions about your visit to the area. Take some maps or pamphlets and pick up some great tips from the friendly staff. Saint-Loup-Lamaire is only 25 miles (40 kilometers) from Morton. Use this locality for easy access to a range of tourist attractions, including Chateau de Breze and Fontevaud Abbey. Just 30 miles (48 kilometers) away you'll find Saint-Cyr-en-Bourg, another nearby area that's well worth a visit. 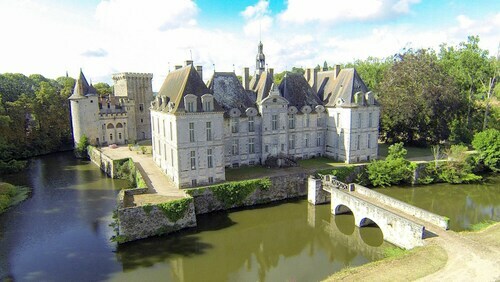 It's a handy base to access unmissable attractions such as Chateau de Saumur and Chateau de Montsoreau. Situated on a river, this historic inn is within 6 mi (10 km) of Airvaudais-Val du Thouet Tourism Office, Airvault Church, and Jacques Guidez Museum. Teleski Nautique Moncontour and Saint-Jacques Gate are also within 12 mi (20 km). Situated in Saint-Loup-Lamaire, this property is within 9 mi (15 km) of Airvaudais-Val du Thouet Tourism Office, Airvault Church, and Jacques Guidez Museum. Saint-Jacques Gate and Port de l'Horloge are also within 12 mi (20 km). 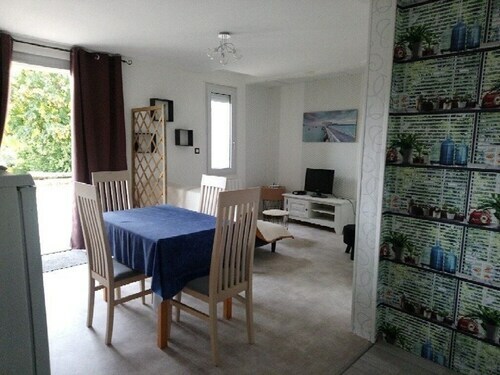 Set in Saint-Loup-Lamaire, this family-friendly apartment building is within 6 mi (10 km) of Airvaudais-Val du Thouet Tourism Office, Jacques Guidez Museum, and Airvault Church. Saint-Jacques Gate and Port de l'Horloge are also within 12 mi (20 km). 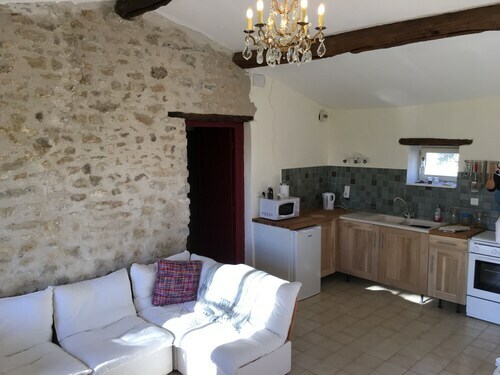 Cottage 4 People in a "small City of Character"
Located on a river, this family-friendly cottage is within 6 mi (10 km) of Airvaudais-Val du Thouet Tourism Office, Jacques Guidez Museum, and Airvault Church. Teleski Nautique Moncontour is 11.4 mi (18.4 km) away. 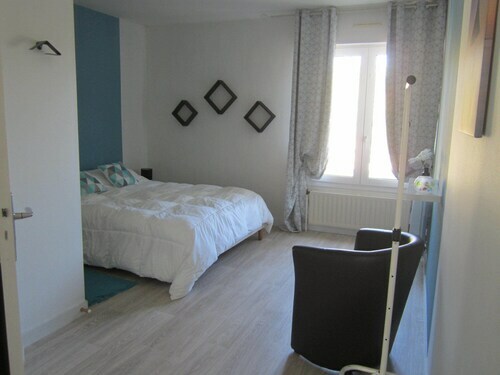 Located on a river, this family-friendly apartment building is within 6 mi (10 km) of Airvaudais-Val du Thouet Tourism Office, Jacques Guidez Museum, and Airvault Church. Teleski Nautique Moncontour is 11.4 mi (18.4 km) away. Located on a river, this family-friendly resort is within 6 mi (10 km) of Airvaudais-Val du Thouet Tourism Office, Jacques Guidez Museum, and Airvault Church. Teleski Nautique Moncontour is 11.4 mi (18.4 km) away. 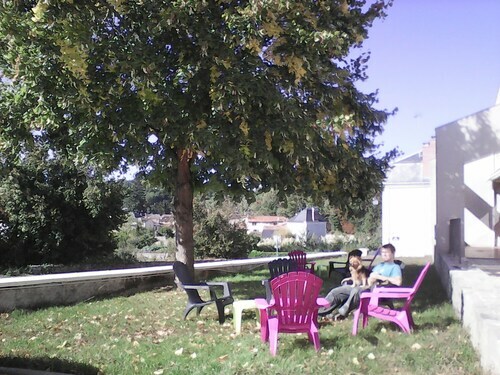 This family-friendly Saint-Loup-Lamaire resort is located on a river, within 3 mi (5 km) of Airvaudais-Val du Thouet Tourism Office and Airvault Church. Jacques Guidez Museum and Teleski Nautique Moncontour are also within 12 mi (20 km). Situated in Saint-Loup-Lamaire, this historic property is within 9 mi (15 km) of Airvaudais-Val du Thouet Tourism Office, Airvault Church, and Jacques Guidez Museum. Saint-Jacques Gate and Port de l'Horloge are also within 12 mi (20 km).